Blondie and Brownie: Bar Artisanal Goes Tapas! 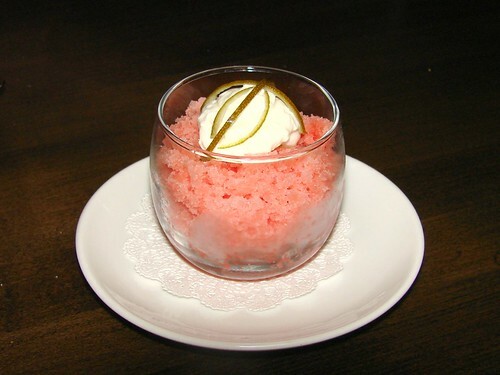 Seriously their Watermelon Granité is easily one of my favorite desserts I've had in the last year. It's like watermelon snow. Cool, light and refreshing, it's the perfect dessert for a hot summer day and one of those desserts that you dream about during the winter. I know I did. I see watermelon makes a couple of appearances on the menu in tapas and salad form, so perhaps there's hope that it could be added to their postres menu. Please, oh, please! I went last friday with a group before we knew about the change. The new menu is interesting and tasty but way overpriced! i.e. 3 prawns for $15. They should have stuck with the old version of the restaurant as a hipper companion to the original Artisanal. The watermelon granite is gone! Sorry, Brownie. @steven: $15 for 3 prawns?! Oy. I like tapas, but my wallet doesn't. Watermelon granite, I will miss you most of all. I'll have to see if that's something I can recreate at home, it was sooo good. What is on top of that watermelon ice. I just have to know! It looks like butter, but that couldn't be. Is it whipping cream? More importantly what's on top of the cream? I cook gluten free so that looks pretty safe, and definitely refreshing!